Disclaimer: The author is a member of The Dark Energy Survey collaboration for the past three years in a limited capacity, and has not contributed to the study discussed in today’s astrobite in any manner, except one- writing today’s astrobite in admiration of the cosmology results being presented here. Figure 1. The Blanco Telescope at CTIO, Chile, that houses the Dark Energy Camera (DECam). Photograph by Reidar Hahn, Fermilab. 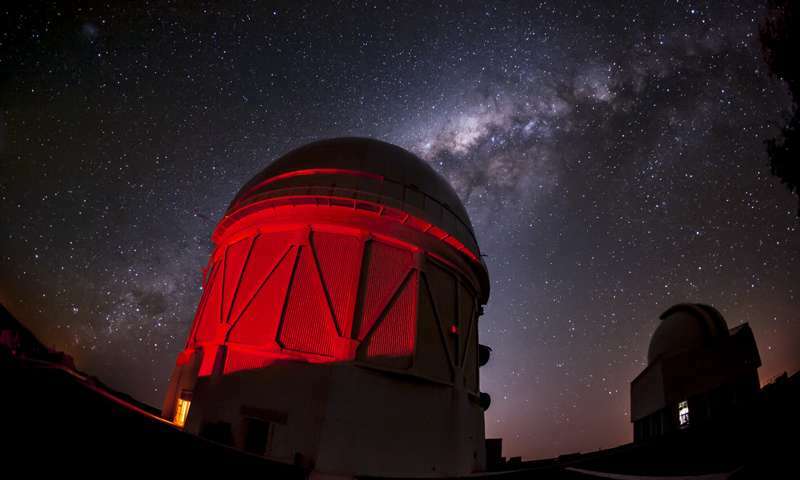 Attached to the Blanco telescope is the Dark Energy Camera (DECam), the gift of the DES collaboration to the scientific community. DECam is a 570 megapixel camera (which until a couple years ago was the most powerful digital camera in the world) that captures millions of objects during every night of operation. Its objective? To put constraints on the cosmology of the universe, and to inform formation and evolution models by studying the distribution of galaxies. 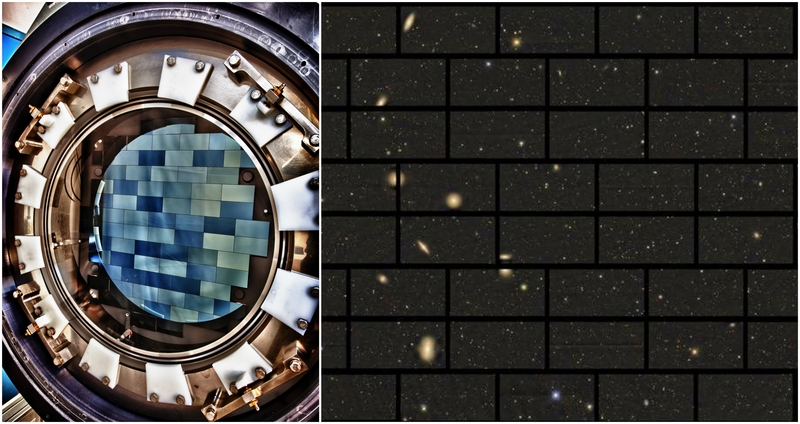 Figure 2. a) The CCD plane for the DECam, which captures millions of objects every night, as seen in b) a single DES image with distant galaxies and Milky Way stars. Picture Credit: CTIO/Fermilab/DES Collaboration. σ8, that depicts the growth of fluctuations in the early universe. The Planck survey has a hold on most of these parameters, but from the vantage point of the old light coming from the Big Bang – the CMB. Our models of cosmology also needs to be corroborated by the current universe’s observations. After all, between the CMB and today, 13.5 billion years have passed. The universe is undergoing rapid expansion, and large scale structure has been forming for many gigayears; surely the evolution of matter as predicted by early universe physics of the CMB can be tested by observing the multitudes of galaxies today, and determining whether they match. DES is here to do exactly that. The observations that DES has produced from its first fully operational year are quite unique: 1786/5000 sq degrees of the total footprint, 26 million galaxies, their shapes, and their positions with respect to each other. DES has been successful in observing the ‘average’ weak gravitational lensing effect of these galaxies on each other – the distortion of light from background galaxies by foreground galaxies as predicted by Einstein’s General Relativity. It should be noted that this distortion is due to gravitational potentials of foreground galaxies AND dark matter (since dark matter makes up ~5/6th of the matter content in the universe). Figure 3. This image depicts mass-mapping in DES i.e. the spatial distribution of dark matter in 1786 sq deg. out of the 5000 sq. deg. planned in the survey. The red (blue) patches signify a high (low) density of dark matter, as determined by observations of weak gravitational lensing. Figure by Chihway Chang (KICP, University of Chicago). This weak gravitational lensing has an extremely subtle effect on a galaxy’s observed position and shape (~1% distortion on average) whose measurements give us fantastic constraints on the amount and location of dark matter in the universe. This is based on how much we think the galaxy positions and shapes were distorted due to weak lensing (see Figure 3). The galaxy-galaxy two-point correlation function, a statistical estimate of how likely are two galaxies to be at a specific distance from each other, which provides information about positions of galaxies. The cosmic-shear correlation function, which gives information about the shapes of galaxies, and the mass distribution in the universe when weak gravitational lensing is considered. A third probe called the galaxy-shear correlation function, that contains information from a combination of galaxy positions and ‘lensed’ shapes, and potential relationships between the two. Using these probes, one can put strong constraints on two of the cosmological parameters mentioned earlier – σ8 (the scale of fluctuations on a scale of 8 Mpc/h), and Ωm (the matter density of the universe). 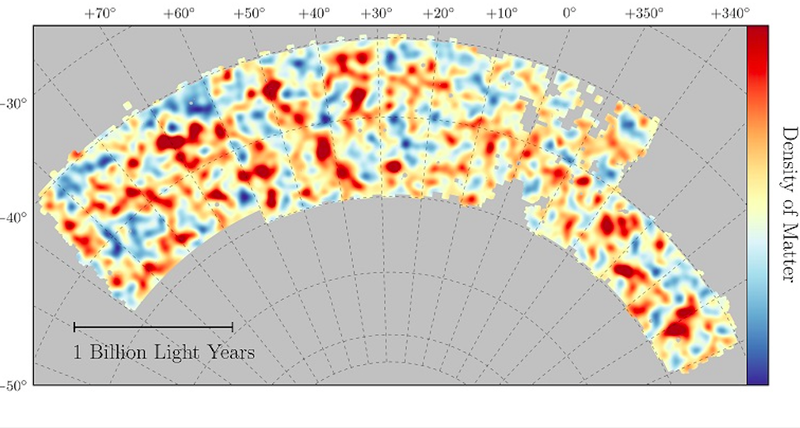 This is consistent with DES observations: a map of dark matter distribution in the universe! The paper discusses the likelihood analysis performed on the data set, given the current prevalent cosmological models e.g. ΛCDM (a universe with most of its mass in dark matter, and dark energy that is responsible for the accelerated expansion of the universe). It is crucial to note that the entire analysis pipeline was blinded until it was complete i.e. the collaboration was only aware of how precise the analysis was, and had no information about the exact value of the parameters. This was an effort to avoid confirmation bias that could potentially plague an analysis that is dealing with such precise numbers. Within experimental error, the DES Year-1 Cosmology results claim an Ωm=0.264+0.032-0.019, and a σ8=0.807+0.021-0.025, well within the standard ΛCDM model predictions (Ωm=0.3, σ8~0.8). In an analysis where the strength of dark energy (w) was allowed to vary, w=-0.80+0.020-0.022 was the result, proving that no signs of departure from ΛCDM (w=-1) were observed (see Figure 4). Figure 4. A plot of fluctuation scale S8 (a robust functional form of σ8) vs. matter density Ωm from the DES Cosmology results – Figure 10 of the paper. Assumed here is a likelihood model with ΛCDM (w=-1), with darker contours depicting 68% confidence level intervals. 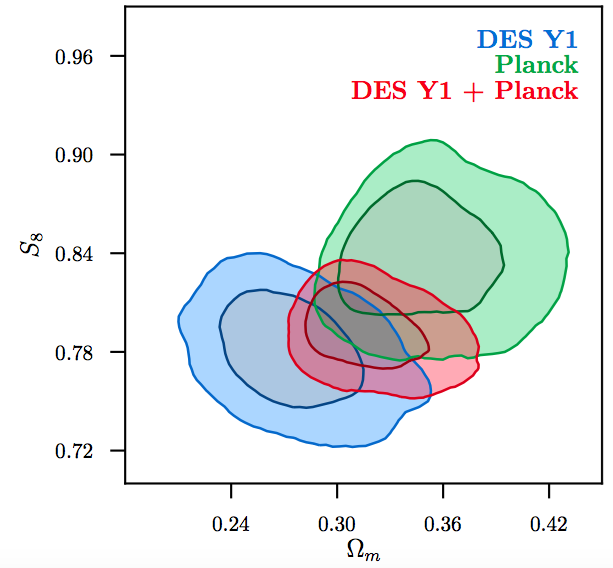 DES Y1 results (weak lensing, clustering, blue) are a ‘slight’ departure from the Planck results (CMB, no lensing, green), but with combined datasets one can see stronger constraints on the cosmological parameters. What do these numbers mean for humanity? It needs to be mentioned (again and again I must add) that DES has produced cosmological precision on two parameters from a ground-based survey, that matches constraints from Planck survey’s CMB studies. Two complementary projects (and many others) have collided to give us joint information about the distribution of dark matter and corroborated our understanding of matter evolution since the early universe, and the applause can be heard. Never before has an astrophysical collaboration used millions of galaxies and weak gravitational lensing observations to probe astrophysical objects at this scale. In the age of precision cosmology, and the alleged tension between various measurements of the Hubble’s constant and subsequent cosmological models, DES has been successful in staking a claim as a mediator. For updates on these parameters as well as more galaxies, keep an eye out for Year-3 results, people! For more information on the new DES results, check out this link. Strands in the Cosmic Web The Bullet Cluster – A Smoking Gun for Dark Matter! Emergent Gravity faces its First Test in Galaxy Lensing Astrobites: A Look back at 2016!